After lots of preparations like: baking trial cakes (and not eating to much of them), making the real cake with all the trimmings, cleaning and decorating the ship and, really important, making the aft deck wind and rain proof (the weather threatened to be grim), at last the big day arrived. Malka wanted, very traditionally, to spend her last night as unmarried woman in her parental house. 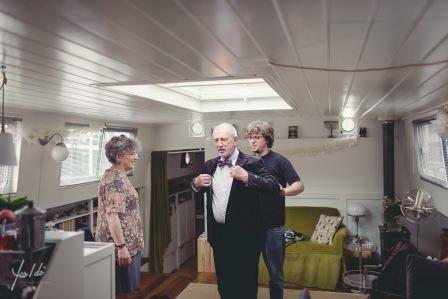 Although she never lived on board, our barge is just that and so, for old times sake, Steven came to stay as well. So, all of a sudden, we were sleeping as a family under one roof (deck, that is) again. On the big day everyone had to dress up and be groomed. Michel had bought a new suit, a suit that Steven fancied! Malka was beautiful and radiant. And, though Michel had said earlier “What a pity I have to give you away” he performed his duty well and handed her over to the very distinguished looking groom. 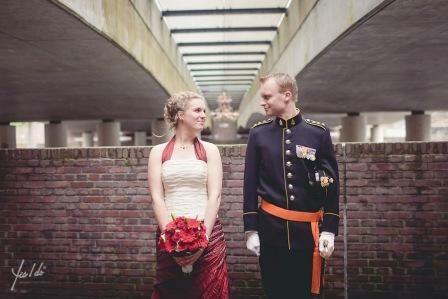 René is in the army and was wearing – a special for this occasion – the dress uniform of his regiment, sabre inclusive which was used to cut the bridal cake. The official ceremony took place on board ‘t Majeur. For two hours she was a public place, being an extension to Town Hall. 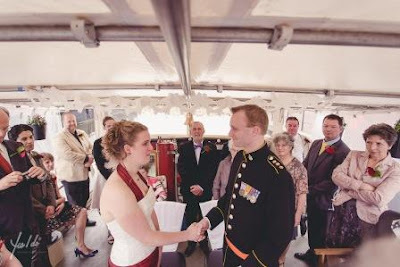 The civil servant who married the couple came on board in full regalia and thought it was a nice change. Although the weather was bleak in the morning, it didn’t rain and we had a patch of sunshine during the wedding ceremony. So, then they were married; time for champagne and cake. Good for me, everyone liked the cake and thought it beautiful. It had been quite a job ….. The cake was cut with René’s sabre, all according to the official ritual. That is to say, the sabre followed the cut, previously made with a kitchen knife, the sabre being to blunt in any case. And this time I cannot pass up the opportunity to post a picture of the brides parents and brother. Whilst everyone was sipping champagne rain came pouring down, drops were clattering in the water and on the sun roof, making quite a racket. Had that happened during the ceremony we could not have heard the official text. Now there was no problem, everybody stayed dry. As said before, the weather was really fine and when the champagne had been downed the sun started to shine again, so we could make a trip after all. Waved at by the bridge-keepers and some passers-by we left the harbour, returning after about an hour. 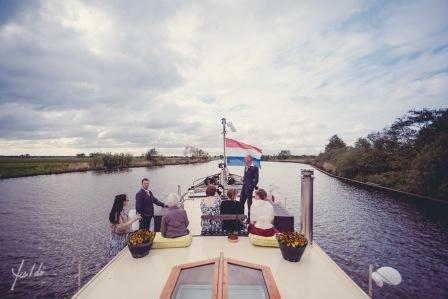 We stayed in Amersfoort for a few more days and we were addressed a few times by passers-by who had seen the marriage, or the boat or the married couple and they all agreed that it was very romantic. One women – living near by – had even told her boy-friend that she would consider a proposal, provided the wedding would take place like this. And the newly-weds were very happy, which is most important. Now we have left Amersfoort and we are on our way to Oostend (in Belgium) were there will be a festival for tall-ships and barges. 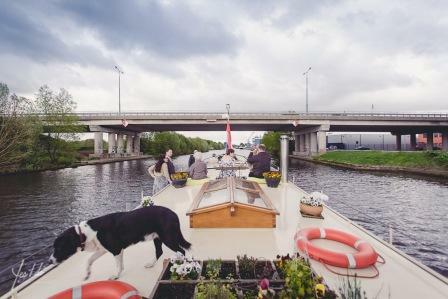 When planning the work on the barge – moored at the quay at Willem’s – we planned a weeks time, leaving again on Saturday. Off course we knew it would take longer, which it did; as it turned out we left on Thursday, but by that time a lot of work was done (most of it and in any case the expensive bits now invisible). It was very familiar to be back, we had been there for almost two years when being converted and we actually lived aboard for the last year. Although it was fun meeting up again and the work was useful we were glad to be happily cruising again after a short period! Via the Noord-Willemskanaal and the Drentsche Hoofdvaart we headed South, it is a nice route but it takes time. I do love it every time the bridge keeper opens the smaller pivot bridges by walking the half moon shaped pontoon. Again we spent the weekend in Dieverbrug and this time we did make the bicycle tour to the Hunebedden. Although a Hunebed looks like nothing but a pile of rocks (2 – 20 thousand kilo’s each) it is an impressive sight when realising they’ve been there for a long time (5000 years), what they were for (burying mounds) and how they got here (rolled over and pulled by hand). Compared to the Egypt pyramids a mere trifle, but still impressive. On our way up we had already spotted a kind of metal armadillo laying on its side on both sides of the Ramsdiep; in Dutch called a "balgstuw", a kind of dam. It is an inflatable dam made of rubber which fills automatically with air and water when the water level rises with 50 cm or more within an hour. The 10 meter high dam offers protection against the rising waters of the Ketelmeer. It is the biggest balgstuw in the world and the only one meant as a dam against rising floods. The idea was that the stuw (dam) would be used at least once a year, but the 2012 occasion was the first since 2007. This leg we didn’t do the polder again but went via the Randmeren and the river Eem to Amersfoort. Luckily the weather got better so we could paint a bit; we have to look our best for the party aboard. At long last the hatches are painted after a 3 year stretch in primer and all scratches and damaged spots have been painted. We enjoyed the wind breaker we had made in Groningen; just a few hooks and we have it hanging on the windy side offering protection. Now we are moored till May 14th in the harbour of Amersfoort with a nice view of the Koppelpoort (an ancient walled gate). In my next blog I will be violating my own rule and so it will contain text and pictures of our social life and not of us barging. It will be about the festivities.